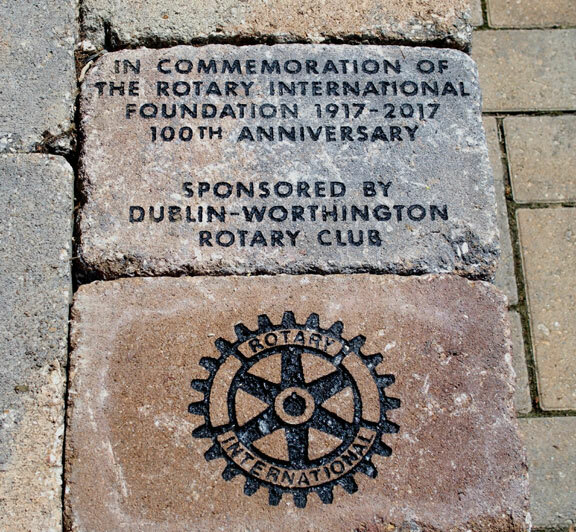 For more than 40 years the Dublin-Worthington Rotary Club has provided funds and the expertise of club members and volunteers to support several major projects benefiting youth and their families and contributing the quality of life in our area. In all, the club has contributed more than $400,000 for these projects and members contributed hundreds of volunteer hours to accomplish them. In 1992 when there was a need for a playground for children with physical disabilities, our club found a solution and took action. 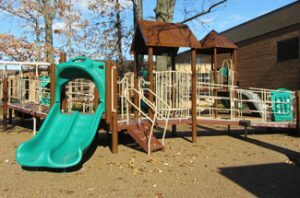 Working with Worthington’s Parks and Recreation, we developed the All-Children’s Playground, located adjacent to the Worthington Community Center. The playground provides an interactive environment for children of all capabilities to share in an open play area. Ramps and a rubber surface make the site totally accessible for wheelchair use. Our club helped again in 2013 with playground renovations through the contribution of funds and volunteer labor. The project included the replacement of the patio and the play equipment. The All-Children’s Playground reopened in January 2014. For nearly 10 years in the late 1990s, our club completed many projects for the Homeless Families Foundation (HFF), which assists homeless families in Franklin County. HFF provided shelter in separate apartment units and offered support services for children, including an education center for after-school programs and summer tutoring and enrichment for elementary and middle school students. The shelter and support services were designed to provide immediate stability for children who were missing school and regular meals, were moved from place to place each night and were uncertain about their future. Club members cleaned and painted apartments and gutted and completely renovated other apartments. They helped rebuild the playground and install new equipment. In 2005 our club, along with the Upper Arlington Rotary, Downtown Columbus Rotary, other local organizations, church groups and businesses, helped to transform a dilapidated building into HHF’s educational center. The renovation project took one year to complete at a cost of $1.2 million. 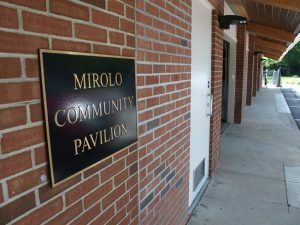 The center housed the foundation’s daycare and after-school programs and also provided classrooms for its summer enrichment program. More than 5,000 volunteer hours were logged with approximately 1,600 of those hours credited to Rotarian volunteers. When Linworth Park was opened in 1998, and there was a need for a covered picnic area for children and their families, our club acted. Members raised funds to build the Rotary shelter at the park, and members used their expertise and technical skills to complete it. The club partnered with the cities of Worthington and Columbus and a local dog-advocacy group in 2012 on the development of a dog park on Godown Road. The 10-acre Godown Park consists of a one acre small dog area and a four-and a-half acre large dog area with benches, a dog water fountain, pathways winding through the park and a paved parking lot. As a service to dog owners our club donated and installed an information kiosk at the park. Club members also designed and constructed a drinking fountain for pets on the Olentangy Bikeway. 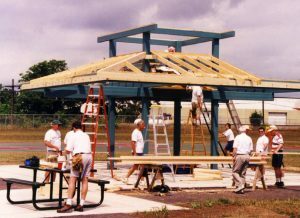 Several years ago I was able to help build new playground equipment for Worthington’s all-children’s playground with Rotary members who helped build the playground the first time 20 years ago. It was a terrific, uplifting experience. 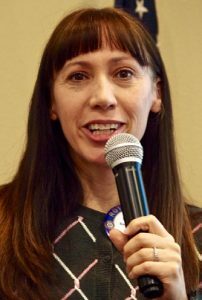 It showed me how Rotary is dedicated to helping the community for the long haul. The event was quite inspiring about the longevity and dedication of Rotarians and our club in particular.